In Washington the Cuban ‘situation’ of which the world at large was only today becoming faintly and uneasily aware, had entered its second week. It was eight days since the discovery by U-2 reconnaissance planes that, ninety miles from Florida, the former hosts of pirates and mobster casino operators were now entertaining Soviet technicians and nuclear missiles with a strike capability against most of the American continent, from Hudson’s Bay to the capital of Peru. For Washington’s political and military leaders it had been a week of nerve-wracking debate in the Pentagon, in the State Department and in the Cabinet Room at the White House. For the unwitting average American citizen a week of lively wrangling over the forthcoming Congressional elections. For the people of Great Britain a week of prurient speculation about a homosexual Admiralty clerk named William Vassall, on trial at the Old Bailey for offences under the Official Secrets Act. For fifteen good ladies in the Borough of Bexhill on the Sussex coast a week of fastidious (‘pernickety’, a bank manager’s wife complained to her friend Lillian Rutherford in Hastings) planning for next Saturday’s bazaar in aid of Moral Re-Armament. Monday October 22nd 1962, the eighth day of the Cuban Missile Crisis, was a tense and hectic one for the staff at the White House, the Pentagon and the State Department as they prepared for the President’s declaration on national television and radio, at 1900 hours, of the naval ‘quarantine’ of the ill-starred island. In North London’s Hampstead Garden Suburb, Evelyn Hunter, wife of a Bond Street jeweller, pressed clothes and packed her husband’s suitcase; he was flying to Amsterdam on Tuesday to stock up on diamonds. She also ironed and packed for her own five-day trip to Bexhill with Andrew Rutherford, whose business partner was a friend of the Hunters from Sidney’s days as a buyer in Selfridges. They were to stay as guests of a divorced friend of Andrew’s. When a 36-year-old married woman is about to spend five days in the country with an unmarried younger man, the question of what she should wear – even when the unmarried younger man is not her lover – assumes more than its usual importance. Evelyn took care to select from her wardrobe sober dresses and cardigans in which she could be confident that her host and his daughter and the virtuous citizens of Bexhill would accept her as a grass widow and not write her off as a society tart. A sense of unease hung over her all day. ‘You’re very edgy tonight,’ her husband observed at the end of dinner, which they had eaten in near-silence. Sidney Hunter had no qualms about his wife going away with Andrew. On Sidney’s Masonic nights Andrew sometimes took Evelyn out for dinner or a show. Sidney was sure – as was Evelyn – that Andrew entertained no plans to compromise her. They had not failed to notice that the average age of the ‘fillies’ in his ever-changing stable was not much more than half of hers. ‘I suppose we will,’ she forced herself to concede. She leaned across to take his dessert plate and stacked it with hers. ‘All right, lovie. I’m sorry.’ He rose and moved round the dining table to kiss her cheek. She patted his head, ruffling the thin hair. Then he went to turn on the television in the living half of the room while she took the dishes out to the kitchen, wondering if – and if so, why – he shared her apprehensions about the visit to Bexhill. Andrew Rutherford left his packing for Tuesday morning. He spent a normal busy Monday at his company’s offices in Mayfair, a display and artwork agency established, with Sidney Hunter’s backing, eighteen months ago which now employed a staff of four and provided Sidney with a good return on his investment. After work he had a drink in a local pub with his agency partner Algernon Farley – ‘Algie’ – who was fifty-five to Andrew’s twenty-four. At 6.15 he met his nineteen-year-old girlfriend Fiona – Lady Fiona Camelford-Jones – outside Swan & Edgar’s and took her to dine at Quaglino’s. After dinner they went back to Andrew’s penthouse flat inSouth Kensington where Fiona duly sang for the supper he’d given her. ‘Will your friend Mrs Hunter be getting some of this while you’re in Sussex?’ she asked as she began dressing. Even stepping into coral-pink knickers, Lady Fiona managed to look ladylike. In September she had accompanied Andrew to a cocktail party in Hampstead Garden Suburb. Fiona thought – and said – that the Hunters and their neighbours were sub-urban (a geographical fact) and Jewish (which was only true of five of the fourteen guests). Whatever opinion the Hunters formed of Fiona, they kept it to themselves, as did Lillian, Andrew’s mother, when she was introduced over a restaurant dinner in Knightsbridge. ‘Mrs Hunter’s not that sort of friend,’ he replied, lying in a black silk dressing gown on top of the bedclothes. ‘I think she’d like to be.’ She fastened her suspender belt. ‘Yes, I did.’ He reached for a cigarette as she pulled up the other stocking. ‘You try a little too hard to please.’ She returned to the bed and bent over to kiss his forehead. ‘Next time think of yourself a bit more. Not too much, of course. We wouldn’t want you to turn into a rugby-player.’ She left the bedroom with a cavalier wave. Moments later he heard the front door click shut. ‘Butch’ wasn’t Andrew’s style – any more than it had been Byron’s. Byron must have had many girls like Fiona in his life. And, quite possibly, a friend like Algie. Evelyn closed her library book in the middle of a chapter, unable to concentrate. She fought down the desire for a cigarette. Only a light smoker himself, Sidney hated her to smoke in bed and was grumpy if he woke in the morning with the smell of tobacco in the room. Tonight he’d taken one of Evelyn’s sleeping pills to calm the nervousness he always felt before flying. Now he snored asthmatically on his stomach beside her. The bald patch at the back of his head shone in the lamplight, a droll symbol of the durability of their union. When Evelyn had first known him in 1945, thirty-two to her nineteen, he’d had a full head of hair which had barely begun to recede by the time of their wedding two years later. You must sometimes wish you had someone a bit more exciting in your life, she repeated to herself and immediately – ridiculously – remembered the thirty-year-old German who’d clumsily courted her in a Torquay hotel two years ago (Sidney in Holland again). In the lamplight Evelyn looked again at her 49-year-old husband’s balding pate and pictured in its place the German’s head with its thick black mane. If – she’d managed to forget his name – were here now, at eleven forty-something, would he be snoring into the pillow, or would his blunt fingers be probing her parted thighs while she arched her breasts into his face, sighing and moaning? She sighed a different sigh from the one in her mind. She hadn’t married for excitement fifteen years ago, she’d married for comfort and security, and comfort and security was what she had got. It was too late, now, for excitement, too late for passion, too late for ecstasy. Evelyn turned out the light and slithered down into the bed. She wrapped one arm round her husband’s body, embracing the familiar warmth of his flabby stomach, and tried to sleep. 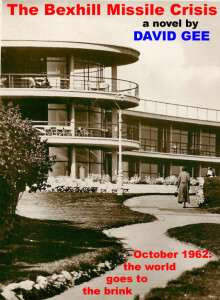 Afterwards, when it was all over, Evelyn would convince herself that her unease, the ‘edginess’ her husband had noticed, had been a premonition of the Crisis that was about to break – the global one in Cuba and her personal crisis in Bexhill. In London it was almost midnight. In Washington it was approaching seven p.m.
A ripple of laughter momentarily exploded the tension in the briefing room. Then, as the picture gave way to the seal of office of the President of the United States, the group of men seemed to draw breath together. If only, Evelyn would think later: if only there hadn’t been the bother in Cuba; if only she’d stayed in London or insisted on going to Amsterdam with her husband; if only she hadn’t knocked the Horseman of the Apoca-lypse and his friend off their motorbike: the week might have turned out very differently. Turning the radio down, Sidney forked bacon and egg into his mouth. ‘Well – obviously you’re not going to Holland,’ Evelyn said. ‘How can you think of business at a time like this?’ she said. Sidney shook his head and brought the fork to his mouth. Evelyn wanted to shake him. ‘Anyway, I’m definitely coming with you now,’ she went on. If she was with him, somehow there would be less danger, or no danger that she couldn’t face. ‘No you’re not,’ he said, still chewing. Sidney’s hand, holding the fork, hit the table with a bang that rattled the crockery. Laurence let fly with the shotgun. A dozen gulls took off shrieking from the fence that separated the garden from the thirty-foot drop to the beach. Two rooks abandoned their scratching at the soil against a plaited willow windbreak and flapped into the watery-blue sky. An agitated face appeared at the kitchen window as Laurence walked up the paving stones towards the house. The housekeeper withdrew, sniffing huffily, from the window. Her real name was Ormsby-Lowndes; Andrew had renamed her three years ago: the double-barrelled name was, he said, an embarrassing reminder that the venerable line into which she had married had been reduced to keeping house for the Dickinsons who’d come up from nothing and were inclined to marry bar-maids. Laurence mounted the steps to the terrace. Beyond the conservatory his eighteen-year-old daughter stood beside a rattan cane chair mopping at her floral print dress with a paper napkin. The sea breeze ruffled her long honey-coloured hair. It was a constant mystery to Laurence that he and Louise could ever have managed to produce anything so petite and exquisite as Sarah. He was a big man, not tall but broad-shouldered and heavily built, running to fat at forty-five; and Louise’s charms had always been similarly on the substantial side. She looked up as he approached. Laurence rested the shotgun against the con-servatory wall. A single-barrelled Abercrombie & Fitch 12-gauge, he had bought it from a farmer at his golf club who’d upgraded to something more lethal to protect his chickens from foxes. ‘My poor roses will never stand a chance with those rooks,’ Laurence said, sitting down in the other chair. ‘No fear of that.’ She entered the house via the conservatory. Laurence watched her go with a smile. He always enjoyed their bantering exchanges which teetered on but never crossed the line into bickering. Not for the first time he thanked God that she’d chosen to live with him after she started boarding school and that her mother hadn’t contested the decision. A teenage daughter, even one as pretty as Sarah, might have proved an encumbrance in Louise’s relentless climb up the social and marital ladders of England, Italy and, currently, the United States. The barmaid from Hastings had gone a long way since her Rita Hayworth glamour turned the head of a lonely sailor on shore leave in 1943 and Laurence also continued to thank God for being left far behind in her wake. He picked up the shotgun and went indoors to change out of his gardening clothes into something more suitable for receiving guests. ‘I hear enough about Cartier at home, thank you,’ said Evelyn. ‘Andrew!’ She went scarlet and turned to him with an outraged expression, then quickly turned her head back to the road as a banked hedge-lined curve opened to an unannounced crossroads and events began to happen faster than she could control them. The motorcycle seemed to appear from nowhere and with no warning engine roar which, in a soft-topped car, she would surely have heard. Coming fast from the right it skidded across the junction with a sudden screech of brakes. Evelyn stamped on the Renault’s brakes and swerved hard, but her front bumper struck the rear wheel of the cycle a glancing blow. On the other side of the crossroads the verge was flatter and lower; brambles overhung a ram-shackle fence with a wood beyond it. The motorbike spun onto the verge with a jolt that catapulted the pillion passenger into the saplings bordering the wood. The motorcyclist gave a yell as his machine piled heavily into the brambles. Fence timbers cracked. The Renault stalled in the middle of the junction. Evelyn put it in neutral and yanked on the handbrake. ‘Oh my God,’ she said again. He steadied her with his hand as she stumbled onto the verge. ‘I hope they’re all right,’ she said. The cyclist detached himself from his machine and the brambles and vaulted the fence at a point where it had been partly flattened at a break in the bushes. Andrew assisted Evelyn over the collapsed section of fence. Her low heels lurched on the soft woodland soil as they hurried to where the cyclist was kneeling over the body of his passenger. He looked up as they approached, the woman who’d run him down, a small auburn-haired thirty-plus woman in a dark-blue linen dress, and her companion, a tall slim dark-haired younger man in a cream-coloured linen suit. The motorcyclist was about the same age as Andrew but stockily built, dressed in a black leather jacket and blue jeans. His pale-skinned face, scratched by thorns, was full and fleshy under tightly-curled reddish-blond hair. Dark eyes stared coldly up at the two arrivals. Evelyn crouched down and began to run her fingers gently over the limbs of the boy on the ground. ‘Don’t touch him,’ the cyclist said. His voice was quiet and controlled, lacking both accent and inflexion. ‘I know what I’m doing,’ Evelyn said. ‘I’ve had some training in first aid.’ She moved her hands slowly across the boy’s chest, feeling his ribs. The cyclist made no move to stop her. A trickle of blood from one of his cuts ran under the collar of his jacket. His expression, as he raised his eyes to Andrew standing over Evelyn, held a hint of scorn. On his back among the withered leaves, legs flat together, the boy looked like a corpse, neatly laid out. He was perhaps eighteen or younger, short and slender with a pale narrow face and straight black hair. Like the other he was dressed in leather and denim. There was no sign of blood or visible injury, but he lay utterly still, eyes closed, his breathing inaudible; only the faint rise and fall of his chest betrayed that he was not in fact dead. A leaf fluttered down and settled on his stomach. Evelyn brushed it off. She felt his neck and jaw, then explored his skull with her fingertips. He met her eyes unblinkingly but made no reply. ‘Can we get him to the car?’ Andrew said. ‘Then I’ll have to go. You’d better come with me, in case I get lost.’ She stood up. ‘Don’t move him,’ she said to the cyclist who still knelt on the other side of the body. His scratches had begun to congeal into uneven streaks of dark red on his pallid skin. Bending forward, he took the boy’s head in his large hands, spreading his fingers as if he would crush the skull beneath them. With his leather jacket and blood-streaked face, he looked to Evelyn like some Wild Man of the Woods crouched over the unconscious body intending per-haps to wrench its head off. ‘What are you doing?’ she demanded. ‘My-oh-my,’ Andrew murmured. ‘Do you have any other tricks, like driving out demons?’ He smirked, but Evelyn found herself shuddering. The boy struggled into a sitting position, assisted by his companion with an arm about his shoulders. ‘Careful,’ Evelyn warned. ‘Are you all right?’ she asked the boy. He managed a fleeting smile. ‘Why doesn’t he say something?’ Andrew asked. ‘He doesn’t speak,’ the cyclist said. ‘Are you sure you feel all right?’ Evelyn asked the boy, who answered with another smile. His teeth were like a child’s: small, white, uneven. He stood up and began to dust the leaves off his clothes. ‘We’d better get back to the car,’ Evelyn said, ‘before somebody runs into it and we have another accident to contend with.’ She supported herself once more on Andrew’s arm as they walked back to the gap in the bushes, the cyclist following with the boy. Jammed upright between two bars of the fence, the motorbike was an old machine, the engine casing dented and dirty. A guitar, undamaged, was strapped between two panniers at the rear. The cyclist untied the instrument and handed it to his passenger. ‘Who’s the musician?’ Andrew enquired. As he heaved the machine free of the fence, the exhaust pipe came partially away. Thorns had ripped the front tyre; the rusty mudguard was buckled. Straddling the machine, the cyclist kicked down on the starter. Nothing happened. He kicked again, harder. The exhaust pipe came off completely. ‘My insurance will cover it,’ Evelyn added. ‘It’s not worth a claim,’ the cyclist said with a shrug. ‘It was nearly done for. We were going to dump it at Dover.’ His voice, as he made this his most informative speech so far, remained uninflected, strangely mech-anical. Perhaps, Evelyn thought, he didn’t do much talking to his mute companion. It was difficult to picture him as some sort of pop or folk singer. The boy’s recovery had not allayed her sense of something sinister, menacing, about the cyclist. As if she felt herself threatened, Evelyn moved closer to Andrew. ‘Are you planning to do your act abroad?’ Andrew asked. ‘You must at least let us give you some money for your fares,’ Evelyn offered. Even though it was her car, her driving, that had created this mess, she felt that she would hand over every last penny in her handbag to be rid of them. The cyclist shrugged again. ‘Okay.’ He turned to the Renault. ‘Nice-looking car,’ he said with his first show of animation. ‘If you take the top off, he and I can ride on the back.’ He waved a hand towards the boy, standing in the road with the guitar. ‘We can make room for him to sit in the car properly,’ Andrew said. While he and Evelyn folded back the roof, the other pair removed from the motorcycle the two panniers which presumably held all their possessions. The cyclist wheeled the clattering machine through the break in the bushes and abandoned it inside the wood. Turning Andrew’s suitcase on its end they squeezed the panniers into the space behind the driving seat. Andrew nursed Evelyn’s mink coat on his lap. The boy settled into the seat behind Andrew with another smile, nursing the guitar. The cyclist sat casually on the back with his legs either side of the boy as they set off. The road left the wood. Now there were houses on each side, new-looking houses and bungalows with well-kept gardens. Evelyn drove at a careful pace. Turning round, Andrew introduced himself and Evelyn. The boy smiled out from behind Evelyn’s seat. ‘I’m Pilgrim and he’s Malcolm,’ the cyclist said. The cyclist had a full-lipped mouth; his smile was merely a brief narrowing of his lips; he did not show his teeth. ‘Go straight over, darling. We don’t need to go through the town. Do you come from around here?’ he asked Pilgrim. Evelyn recalled what she had thought as he crouched over the boy in the woods. ‘That’s the law of the jungle,’ she said. ‘It works for the jungle,’ Pilgrim said. ‘Andrew, I did not!’ she protested, reddening. ‘Not much protection from missiles in a cellar,’ Pilgrim said. The road climbed a hill, passing trim little cottages and mansion-sized houses, then descended to a golf course and CoodenBeach station. A bridge carried the railway over the road. ‘Oh look, there’s the sea,’ Evelyn exclaimed. Evelyn turned her head to check on Malcolm as she slowed for the roundabout. He gave an impish grin. She glanced up at Pilgrim, who met her gaze expressionlessly, bracing himself now with his hands as well as his feet. She suppressed another shudder. Beyond the roundabout fifty yards of shingle sloped down to a wider expanse of sand. The tide was on the turn. Low rippling waves encroached slowly on the glistening sand. Half a mile out a yacht turned into the wind, its white sail fluttering. Some children were playing on the sand. Two elderly women chatted on a bench. The sun shone weakly. There had been fog at Heathrow this morning, but here it was a mild after-noon, almost warm. ‘Doesn’t look much like Armageddon, does it?’ Andrew commented. ‘It’s lovely,’ Evelyn said. ‘Don’t say such things.’ She pressed down on the accelerator and the view of the sea was lost behind the first of the houses on the low cliff that began after the exposed stretch of beach at the roundabout. A few minutes later Andrew directed her into the gravelled drive of a large house with a timbered façade and elaborate brickwork. A garage with rooms above it was set to the rear of the house on its left side, flanked by greenhouses and a garden shed. ‘And you obviously don’t. Shall I stop here?’ She did anyway, parking beside the main entrance. The front door opened and Laurence came down the two broad shallow steps. Introductions and Andrew’s account of the incident in the wood were brought to a sudden conclusion when Malcolm slumped against the side of the car; he would have fallen onto the gravel had Pilgrim not moved to catch him. Laurence quickly led them into the oak-panelled entrance hall where the housekeeper was waiting. Pilgrim set Malcolm down on a brown-velvet chaise longue. Evelyn knelt on a Persian rug beside the couch, took the boy’s pulse and felt his neck and chest for an injury she might have overlooked in the wood. Pilgrim sat on an oak chest near the front door and began to roll a cigarette. Laurence and Andrew stood at the head of the couch. ‘Sorry to dump this on your doorstep,’ Andrew said. Evelyn looked up anxiously. ‘I can’t think what can be wrong with him,’ she said. ‘Concussion can be serious enough,’ Evelyn said. The housekeeper returned with the information that the doctor was on his way. Laurence instructed her to take Mrs Hunter to her room. ‘Oh, but I ought to stay with him,’ Evelyn protested. The housekeeper led Evelyn up the broad flight of stairs to the first floor. They looked down at the boy stretched out on the couch, eyes closed, a whisper of breath issuing from his parted lips. ‘Cute little thing, isn’t he?’ Andrew said softly. ‘Isn’t he,’ Laurence echoed. Across the hall his eyes met Pilgrim’s. Pilgrim held his gaze until Laurence looked away.